Craft Bilt aluminum picket railing is designed for on site custom fabrication to acheive a seamless blend with the architcture of your home or cottage. Engineered with safety in mind. 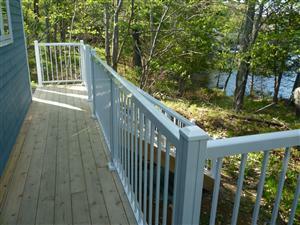 Our railing meets all residential and commercial building code requirements. We offer many different styles and colours including custom paint. Our railing has no visible fasteners so you will not have unsightly rust stains. a long lasting trouble free finish.